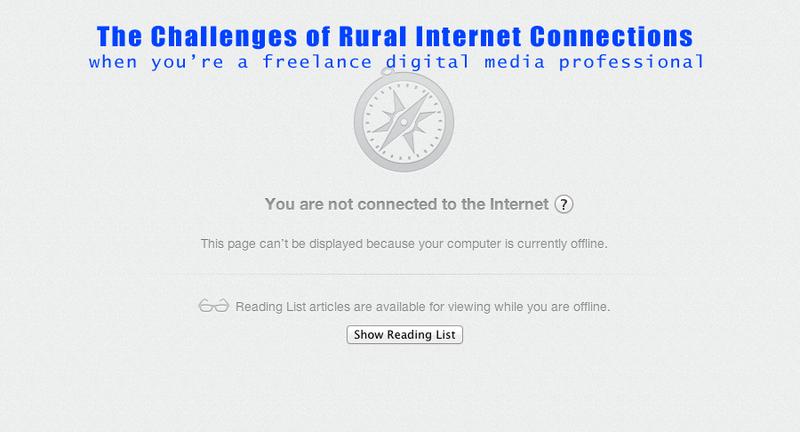 "You are not connected to the Internet" I see this screen far more often than I should. I've been living in the countryside for about a year and four months now. We are so far out of the nearest town, they don't have any sort of cables or DSL lines running to our property, so our only option for internet is literally the archaic dialup (who even has a 56k modem anymore?) and Xplornet Satellite Internet. So we went with Xplornet. After all - it initially seemed like it should do fine. Their Advertisements on billboards around town suggest you can 'stream, download, game, etc"… Well in actuality, you can sometimes do that, but hopefully you don't ever need to actually do those things because its connection is about as reliable as… well… do you remember that telephone on a string game you play in kindergarten? haha. Here are some of the challenges I face, sometimes daily, more likely to be weekly, and its a really great month if I don't have an issue at all. Well pretty early on I realized I can't game anymore. You see I used to like playing Call of Duty to kill some free time here and there. Totally out of the question. I can't even get to the point of being 'that guy who's frozen and glitching out in the map' because it won't sign on. But thats not the worst - that fact has helped me focus entirely on doing work which is sort of a blessing in disguise. You should still be aware of it. No gaming. - Candy crush saga you can probably get away with, but certainly not anything on a 'console' or played in 'real time'. It's slow. As a freelance professional I actually relied upon watching YouTube whenever I needed to learn a technique for a particular project. YouTube is a wealth of information. In fact, to paraphrase my uncle, the university professor; "YouTube is the single greatest collection of educational information available today". In my eyes, if anything is going to make the education system more or less obsolete, it will be YouTube. I took advantage of that wealth of information, but its hardly an option now. Unless you're able to watch things in 144p resolution and still have to deal with it pausing to buffer every minute and a half… You're not going to learn to do anything very effectively. The slowness can be a good thing too, for instance sometimes perusing Facebook and I see someone shared an article that sounds interesting - only to click on it and find it's one of those 'click-bait' articles where you need to click "next" through 24 pages to get the full gist while you're bombarded with advertisements - I am not going to waste my time (or bandwidth) on that anymore. I am thankful for that. The slowness has made my own time more valuable to me. Lets talk about the limited bandwidth. You know that big deal about net neutrality, and ISPs 'throttling' people's connections? Well thats a reality for me. 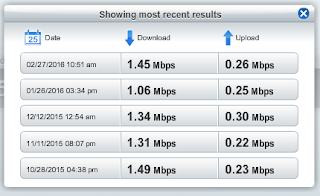 I get 2GB per day at which point my internet becomes throttled until 2am when I get free overnight bandwidth. 2GB is not a lot. To put it into perspective for you; if you set Netflix to play on the lowest resolution, it spends about 300MB per hour of video you watch. 2000/300= 6 hours and a bit. Thats if you're only watching Netflix, and only watching it on low quality. So if you enjoy Netflix in HD, don't take that for granted - I know I did before we lived here. For myself, I actually spend most of my bandwidth in uploading. I am constantly producing work that needs to make it to the internet in order to earn me money, so when I get throttled - thats like jamming up and freezing the assembly line that is my office. Angry Modems. I don't know how else to describe it other than Xplornet and my modem have a personal problem with me. Maybe I overwork it - haha. But seriously, if it starts raining - my connection might drop. If it starts snowing, my connection might drop. If I look at my modem the wrong way - my connection might drop. And unfortunately this goes in a cycle, so when my modem is feeling finicky, sending any request to the internet through it is like 'the straw that broke the camel's back' and it does it's own hard-reset and powers down. This is the bane of my existence, and if everything I mentioned above was tolerable - this of all things most certainly is not. I even suspected that my router was getting old and not handling the flow of information to the modem properly, so I spend upwards of $200 on getting a brand new professional router with all sorts of features, to no avail. As for other fixes, I tried some 'holistic medicine' and started keeping ice packs around the modem as I read some Hughes Modem users thought the issue was attributed to overheating - and like everything else - to no avail. "Call Xplornet" you say. And of course I have. Probably the first time it happened, and second and third, and after that I realized "Hey they don't actually have a solution, or are not even willing to admit a problem so how could they possibly fix it?". Their best solution has been "try resetting the modem" sort of like Stan Marsh, the eight year old in South Park that one time. Xplornet's best advice rivals South Park in that respect. And that was all the 'technical support' we got while we were inside the 'labour warranty period'. Of course, after we were out of warranty period, they were happy to put in a work order for us at a couple hundred dollars out of our own pocket, and admit that their equipment wasn't working as it should. You should watch the video I've attached to see what I mean with the dropping connection. To be fair, it may not be Xplornet's fault. It could be the Hughes Satellite modem that is the source of the issue. So I contacted them as well and their customer support was even more horrendous than Xplornet. There isn't even anything worth mentioning. I gave them serial numbers of my satellite and modem and they still couldn't find me in their system so I figured there wasn't much of a chance that they could do anything. At the time of writing this (while offline), I am currently in day 2 of a no-connection cycle. The longest cycle has lasted 7 days, so my fingers are crossed we don't have a repeat of that. I try to appreciate these times - it gives me a reason to put down the mouse, and pick up the camera, do some housework, file some paperwork - the things I'd otherwise put off while there is other work I could be doing online. 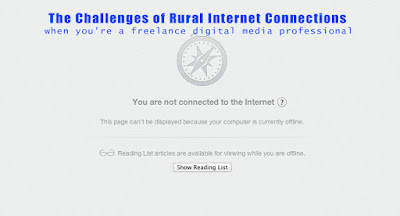 The major purpose of writing this was venting steam you may say, but I think it's important that everyone know about the challenges you face with rural internet connections. It's been great to be out here in the rural countryside because I have very few distractions to take me away from the work I need to do, but at the same time - its very challenging to try and do work when your equipment just won't let you. It's like trying to commute to Toronto from the suburbs and your car won't start, and you're so far out of town there is no public transit, no taxis, to help you get there. Just the super expensive equivalent to hiring a limousine that is tethering to my mobile phone's data with Koodo when I have something really important due. 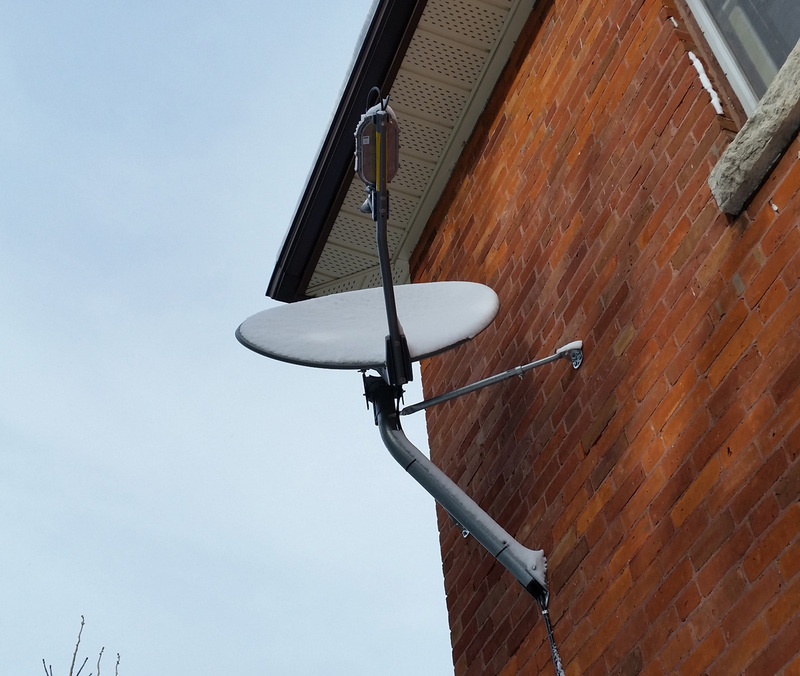 That was the other really strange bit, how is it my 8oz mobile cell phone has an infinitely faster and more reliable connection than a satellite dish and modem that are about 100x it's size? Questions I am not supposed to ask I guess. So… the takeaway for you should be ; don't move to the country and expect to be able to work on the internet before you research your options for internet connectivity. Talk to the people who use those ISPs where you want to live. I like to be as fierce a supporter as I can of all Canadian businesses, but Xplornet is certainly trying my patience. If using Xplornet is unavoidable for you, as it has been for me this last year, the only pattern I have found that has helped me to retain some degree of reliability has been this; keep a constant trickle-feed of data uploading, which I do by FTP. Luckily I shoot microstock photo and video for multiple agencies, so I have a reason to keep a constant flow of data leaving my house. If I ever let that trickle-feed stop, thats when I tend to notice it gets more unreliable in its connectivity. And when I lose that reliability it takes days to get it back. Keeping a constant upstream of data isn't going to be easy for most people, but if you can do it - you probably should. I don't know why this works, or if it even does work - I may have just been looking for a pattern so I found this one. I don't really like to gripe about my problems, ever. I'd much rather focus on, and share the solution, but unfortunately, this seems to be a problem without a solution. So the only help I can offer is to inform people of the issue so they can avoid it themselves. Generally I am not a big fan of the process of packing up a house and moving, but I am super excited for this next move - back to a city where I can be firmly situated on the grid via real cables and wires.